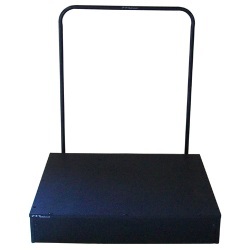 School Music Equipment → In Stock - Ready to Ship → Modern Conductor Podium Top with Hand Rail - 32" x 38" x 6"
Modern Conductor Podium Top with Hand Rail - 32" x 38" x 6"
This is a lightweight podium with heavy duty construction and features a hand rail. Constructed with 3/4" thick compressed wood and covered with a non-slip coating. The railing easily detaches with a locking clip and stores underneath with clips. The side features built-in wheels for simple mobility. ***For quantities more than 3 please call for freight quote.